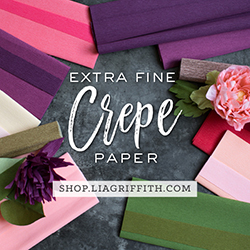 I’ve always loved beautiful stationary, so when Schuyler Polk of Polk Paper reached out to me I thought it was the perfect time to pursue one of my dreams – to create floral liner stationary sets using images of my paper flowers. And boy am I glad that I took the opportunity to respond to Schuyler’s DM! This beautiful stationary set is the result of our collaboration. Isn’t it just GLORIOUS??? Talk about the perfect collaboration. Schuyler completely understands and appreciates my style and my flowers. Not to mention that she has a fantastic eye for colour and composition – she made suggestions for the envelope colours; she positioned my floral images on the envelope liners; and she took photos of the set with real flowers for the flat lays. The only thing I did was send her photos of my paper flowers. The set is available for purchase for $47 USD on Schuyler’s Etsy site. They come in a set of 12 flat personalized cover weight note cards, with 3 distant drums (beet envelope)(I am teaching a workshop on how to make these Distant Drums), 3 dahlias (soft coral envelope), 3 ranunculuses (cipria envelope). Here are more images of the stationary set – I’m floored by how gorgeous they turned out. I have a set of 10 of the distant drums and I use them as Thank You cards with my orders. They’re even more beautiful in my hands.